In my last post I mentioned that I would be offline for about a week as I recovered from a routine operation. Well that took far more weeks that I thought. Closer to six. I am only just getting back to 100%. Seeing as I have not been doing allot of work, the thing I have been utilising the most is an app for managing my D&D campaign (that's Dungeons and Dragons for all you non gamer types. And when I say gaming, I mean old school pen and paper D&D. D&D experienced a downturn in sales when they launched their ill fated D&D 4. Wizards of the Coast, the current owners of the D&D franchise thought they would smash together the successful 3 (and 3.5 update) with Magic The Gathering, the other successful franchise that they own. The result was a terrible hybrid and fans of the game, many who had played the game for decades, abandoned the game in their thousands. In 2012, WotC released version 5, the unofficially names "We're Sorry" edition. Since then it has experienced quite the resurgence. What has been lacking since 2012 is a slew of digital tools for GM's (Game Masters, the individual in a gaming group that organises all the other players acting as story teller, game administrator etc). Many other companies have tried creating all sorts of cool apps, especially the kind that help the harried GM keep track of all the data necessary to run a long term campaign. Those apps and sites have constantly been harried by WotC's strange approach to licensing. 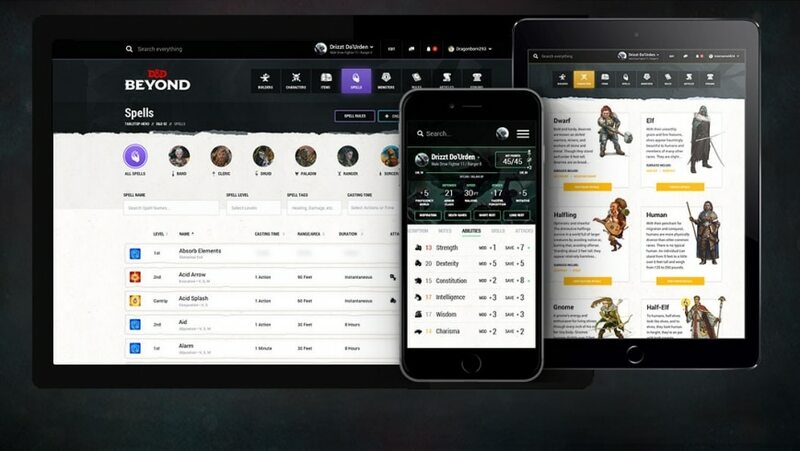 I have used many apps, particularly Android ones (and I am happy to review them if you are interested) however after 5 years of waiting, Dungeons and Dragons Beyond is recently out of beta and available to GM's and players alike. D&D Beyond is an website, an app, an archive, an online editor with new features slowly but surely being added. I primarily use the web site. Here I have purchased digital versions of the three core books needed to play the game irl. I actually already own the physical versions of the books, however having digital versions available on the website and the app make referencing much faster, therefore speeding up game play. On the web site, as well as having digital references I have "live" character sheets. These are digital simulacrums of the paper versions, however instead of having to find the page number for the game mechanic of something or other referenced on the paper character sheet, I can just click on the feature on the digital character sheet and in most cases gaming mechanics appear in a drop box without having to leave the sheet. Occasionally the link is to a reference page, however the speed with which you are able to reference immense amounts of data just reinforces how happy my decision to pay some extra money to have digital versions of all of my reference material. I am still awaiting more features. For you rpg gamer types, I am waiting for things like initiative and HP trackers mainly, however the lure of more powerful world building tools is tempting me to take our a subscription, which for long time readers of my blog, is a big deal (ie: I hate the subscription model). I primarily use my Pixelbook for research, game writing, and the actual game and then the free Android app when a gaming thought strikes me whilst I am doing something else. Whilst the app is free, you need to unlock the content, however when you unlock the content, it is available across the web site and two mobile devices. So that is what I have been doing whilst on sick leave. I hope you don't mind my extending this productivity into my rpg gaming hobby.